So lifelike! Just as if the real thing were part-paper. If the thought that you still own an iPhone 4 or 4S makes feel you all Sad Face, cheer up: there’s a low-budget way to upgrade your device to modern iPhone 5 dimensions. What it lacks in technical functionality, it more than makes up for with practicality, price and Make style. It’s called iFaux, and you can download it for free. iFaux is a do-it-yourself papercraft upgrade that slips neatly over the top of your 4 or 4S, adding the extra millimetres you need to give your device the height it needs to meet today’s, um, higher standards. 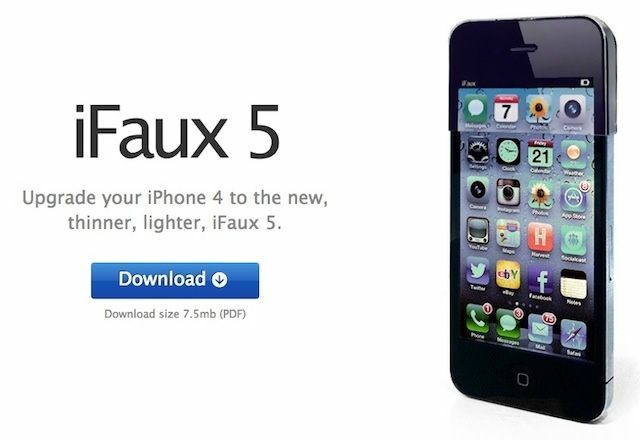 Check out the features: the thinnest and lightest iFaux ever. Because it’s the only iFaux ever. Papertouch display, made of paper. That you can touch. With deft use of a sharp blade, you might even be able to make a hole through the iFaux headphone jack so that you can push through your real headphones and plug them into the real headphone jack. Backwards compatibility, folks. Backwards compatibility.